Speaking to the Forest. Feeling Affinity for the Woods. There's no Half Measures. Face Every Challenge Seriously. The still popular dish Poche Potatoes is made by burying potatoes in the snow in winter to ferment. The fermented potatoes are peeled in spring, then crushed and washed repeatedly to wash out the starch and then dried. The dried potatoes are milled into flour to make dumplings. “Everyone loved being with grandma, so we'd work on that box while she taught us how to do it. “You have to make each one carefully. 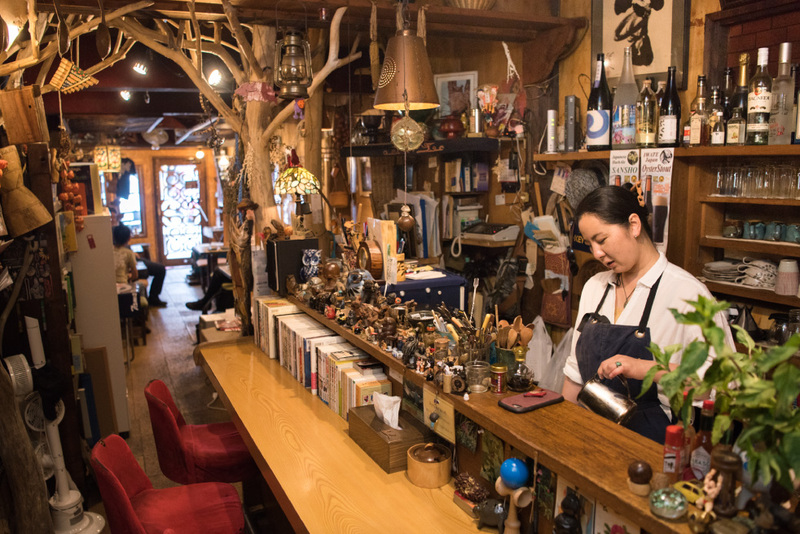 The things we sell to our customers are made with care, and with the memory of our grandmother. That's the kind of thing I want to offer our customers, I want them to know that we're confident in these Poche potatoes, that they will be delicious. "Cooking that was handed down from grandmother, to mother. From mother, to us. I want to do something that we know is right. Even if someone tries to tell us different, we can show them how it should really be. It's not 'This! 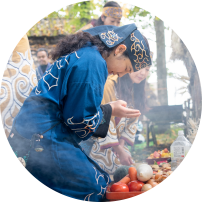 This is what real Ainu cooking is!' 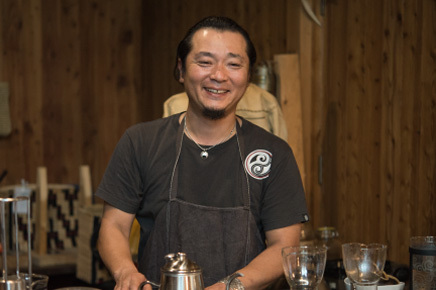 but this is how our family does it, the Ainu cooking that has been passed down to us." 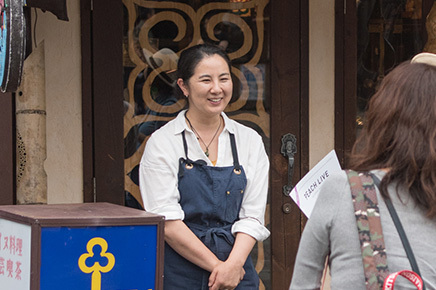 "We also serve wild plants that we go out and pick ourselves, which is fun, but hard work too. We were taught not to pick everything in one place.” If you pick everything in one place, then the next year no plants will grow to be picked. You take only what you need, then leave the rest for the next year. It's the way it is done here. "We go to the mountains and woods with my aunt and mother a lot, but I don't think they're intending on teaching us or anything. I felt more like we learned by standing by and watching what they did. And my aunt would talk to the trees, like if she saw one fallen down she'd say, 'Oh, looks like you're tired. You just lay there and take a rest!' Or she'd talk to the plants. 'Well hello there, how are you? Listen... Oh, really?' she'd say. Watching her like that made me feel closer to the woods. It was more just watching than being taught, you know. I love the wilds." The bracelet she's making now uses thread made from elm, irakusa nettle, and oriental bittersweet fibers. Making thread from plants means drying them, shredding them, and then spinning the fibers into one long thread. was seeing an Ainu nettle exhibition at the museum. 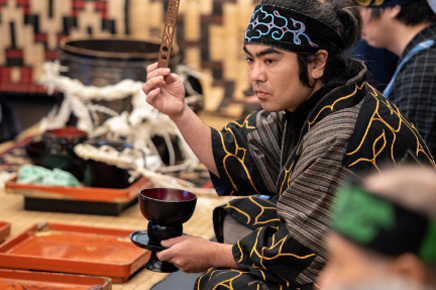 “I saw an emush-at (sword hanger) made with irakusa weft, and the threads were so strong it was still in perfect shape. The threads themselves were still strong and beautiful. The colors were still clear, and I thought they were so different from cotton . So, I decided to try it out this time and see if I could make them." There's a traditional way to make emush-at, but bracelets are something new. This idea of making something totally original is causing worries of its own. "If the bracelet fastener is ugly, the whole thing is ruined. Right now, I'm trying all kinds of things. I'm thinking about how to handle the fastener if we attach some of Ague’s silver. “There are traditional patterns our ancestors made, and I've come up with some of my own. I'm thinking about whether to use a single pattern, or a series of connected ones, but sometimes the finished product comes out totally different. Sometimes I have to unravel it and start from scratch. " She says that it's quite fun once the weaving begins, but the problem is kaeka, making the thread. "If you rush kaeka, then the thread will break, and you'll mess it all up. You can only do it right if you're careful and you focus. It's more fun if you’re making it for someone. “It's kind of exciting to think about that person, and you can make it better. It takes a lot of work, and even embroidery uses things made from natural materials, so you have to really put your heart into it and do it with care or you'll never get anywhere. " 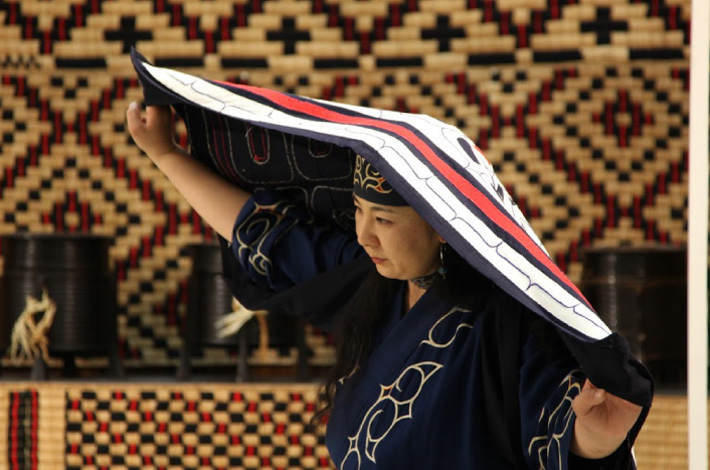 Ainu handicrafts require working with natural materials. "This person told my grandmother they would hand something over to her. 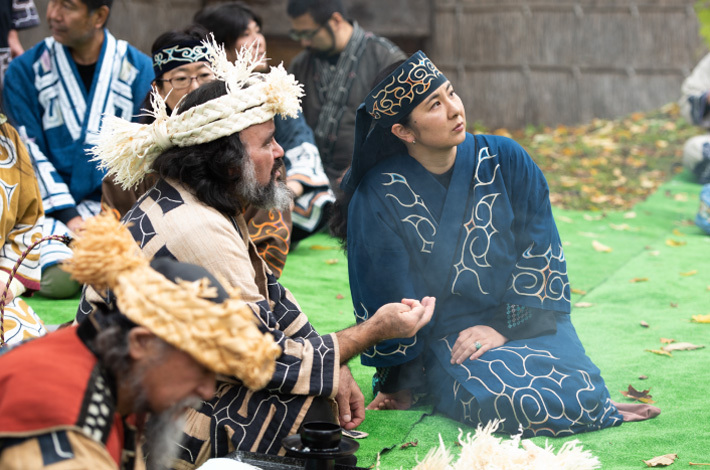 So, our family all went to that person's mountain for kamuynomi [a special prayer ceremony]. He'd marked a tree for grandma, so we had a kamuynomi for that tree, then cut it down and took the bark. Grandma taught us what to do the whole time. We also took our kids along. My sister and cousins were there too, everyone learned so much from grandma. " 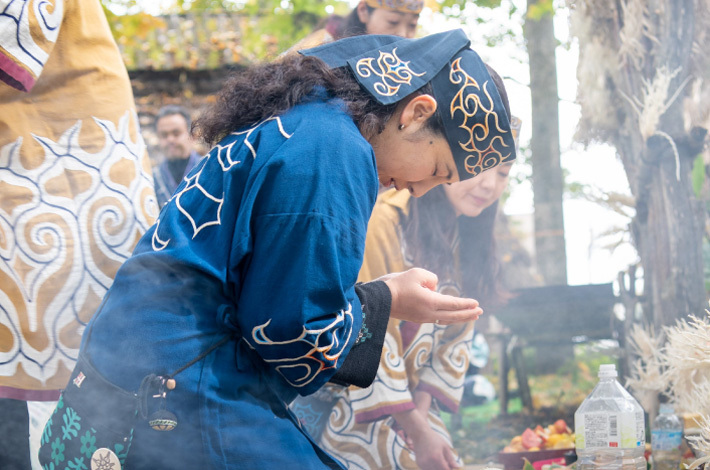 When going into the woods for a tree, first they hold a kamuynomi, a special prayer ceremony to offer thanks to the spirits of the forest, and to the tree they are going to cut down. Then they fell the tree and remove the bark. Removing the bark will kill a tree, so they make sure to only do it from trees already marked for logging. Their grandmother planted seedlings in her own yard and spent 40 or 50 years raising two elm trees. "The thread I'm using now came from those trees grandma raised. 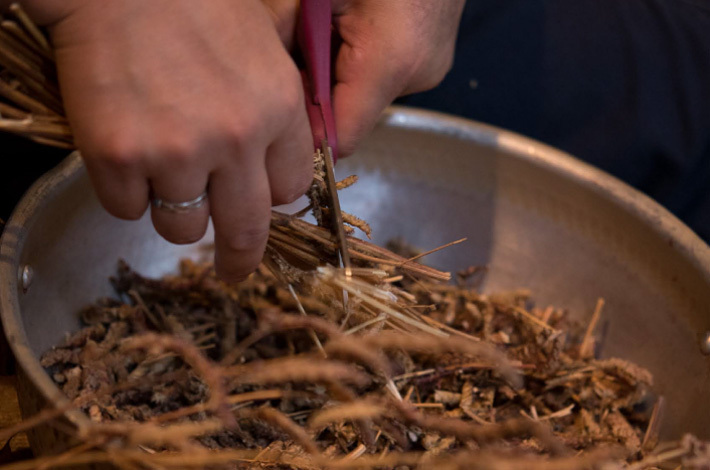 I'm using materials my grandmother helped grow, so feel like I can't do this half-way. " 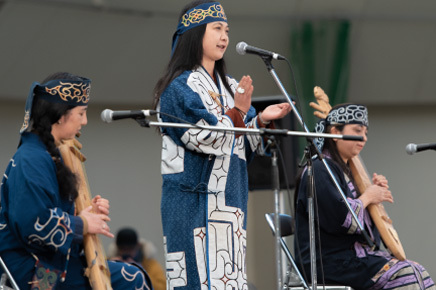 Together with her sister, Fukiko sings Ainu upopo folk songs as part of Kapiw & Apappo. 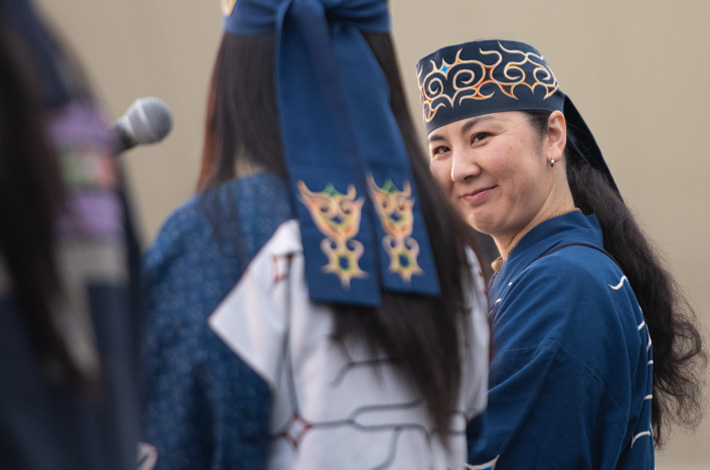 When they first began, she hated getting up in front of people, but she's now grateful for the experience and the chance to meet so many new people. "At first, it was a struggle with myself. I had this feeling like, 'What do you think you’re doing?' and I was scared. I didn't want to do it. I think it's fun to watch people who are naturals on stage. “Now I don't like to let someone else lead the group while I'm just one of the people in the background like everyone else. “I feel like my work with Kapiw & Apappo has helped me understand how to face myself, and to have confidence when I'm out in front of people. It's the same with dancing for the Foundation dances. You can't do it half-way. It's just like handwork. " 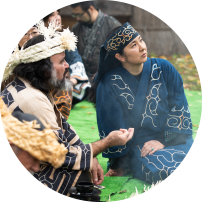 Cooking Ainu food, singing Ainu upopo, dancing, and using natural materials. 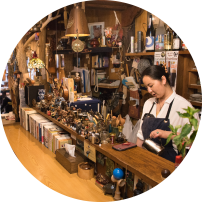 In everything she does, Fukiko faces each task head on with all her heart, just like her handicraft.